Why don't we offer a registry of infected addresses? Several Internet sites offer the opportunity to list an address where a person believes s/he encountered a bed bug. These searchable reports are then available to other visitors interested in learning about the bed bug history of a hotel, residence or business. Are these reports and resources of value or do they simply add to confusion and worry? We believe that these reporting sites may be more deceptive than of value. Why? The reports are subjective. Anyone may file a ‘report’ of a bed bug encounter or sighting, and for any address. Few, if any, of the reports have been verified to confirm that the ‘bed bugs’ were bona fide bed bugs. Because most people seem to misconstrue any insect (or bit of fabric lint) on the bed to be a bed bug, and that any bite-like reaction must be from a bed bug, then it is quite likely that many (most?) of the reports are incorrect. Whereas many such reports may derive from folks who earnestly wish to offer a warning to others, there’s no mechanism to stop a devious person from filing a prank report of a supposed infestation at the home or office of an enemy or competitor. These spurious reports may damage reputations and result in loss of business. There seem no means by which a person or business injured by such a claim can challenge the accuser or refute the claim. Because there is no means to sort the wheat from chaff, and because these reports generally lack any level of authority, they may provide more misinformation than actual substance. This is a case of bad information being worse than no information whatsoever. We would like to hear your thoughts on whether you have used such a service to file a report or warning or to respond to one. Do you feel a registry service for reporting any type of infestation is useful or an invasion of privacy? What mechanisms do you think can be put in place to offer an objective and independent confirmation process that would satisfy both the reporting party and the owner or manager of the location being identified? 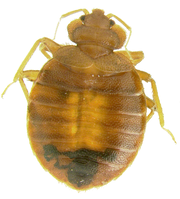 IdentifyUS offers expert identification of pests including bed bugs. We offer quick turnaround and have no commercial or third party interest in treatment products or services. You can submit a sample using our Specimen Evaluation Form and by uploading digital images of any creature you wish to have examined and identified.